This irresistibly interactive journal is filled with dozens of clever ideas for recording your life, such as "Make balloons out of photos from special and happy occasions" or "Fill the genie's lamp with wishes." The author/illustrator's wonderfully layered photo-illustration montages invite readers to mix media, too, and make this keepsake truly their own. I'm a sucker for any kind of book that helps me to release and reclaim my creativity so when this book became available, I couldn't hit yes fast enough. I don't have a single regret. At 6.5"x9.25", this book gives enough space to get creative. Granted, if you're a collager that likes to use bulkier items, this may not be the book for you. Considering it is a book and bound like a book, it doesn't allow for super bulky items to be added to it. 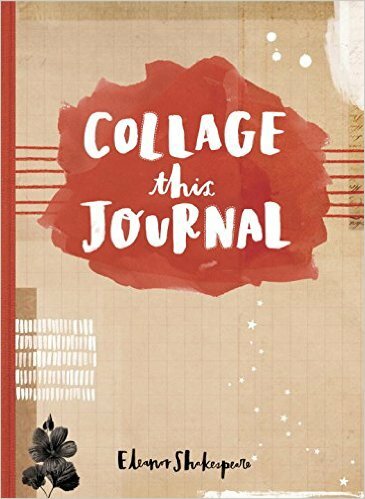 Still, the writing/collage prompts really get you thinking and looking around to see what you can use to make this book truly your own work of art. Hey, for us hoarders, this may be the perfect way to use up some of those napkins, ticket stubs, etc that we've held onto over the year with no idea what we're going to use them for! I highly recommend looking around your own space and getting creative while you collage. I can't wait to dive deeper into this gem of a book.